Jihad Watch reported on Saturday about these riots: Muslims “set fire to at least 30 Hindu houses of the village. They also looted and vandalised a good number of houses in that village.” Why? Because one of the Hindu villagers was rumored to have criticized Muhammad on Facebook. However, that man is illiterate. This was just an excuse for the Muslims to “strike terror in the enemies of Allah” (Qur’an 8:60). 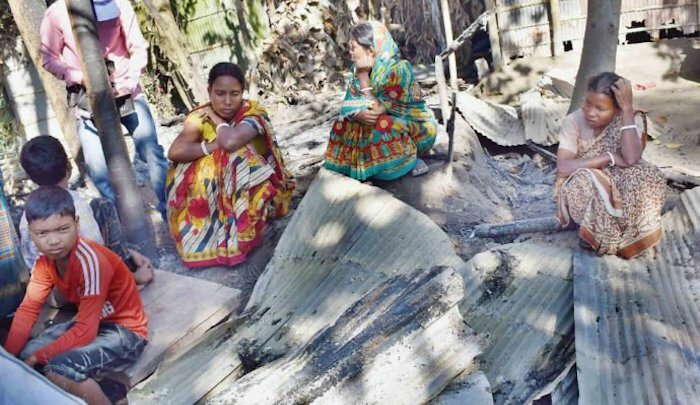 “Illiterate Titu Roy’s sketchy Facebook account,” by AKM Faisal Rahman and Liakat Ali Badal, Dhaka Tribune, November 11, 2017 (thanks to The Religion of Peace): A controversial Facebook post is said to have triggered the communal attack on the Hindu houses in Ranglpur’s Thakurpara village. There were rumours that one Titu Roy, originally from Thakurpara but currently living in Narayanganj, put up a Facebook post defaming Prophet Muhammad (pbuh) a few days ago. However, an analysis of the said Facebook account from where the controversial post was published shows there is a good chance someone else might have impersonated Titu. The Facebook account resembling Titu Roy is named ‘MD Titu’. The ‘MD Titu’ account was opened on Facebook just two months back in September this year, although he had managed to make 288 friends by this time. It appears whoever opened the account has only a handful of Titu’s photos and posted them tirelessly, almost every day. Several photos of people appearing to be relatives of friends of ‘MD Titu’ were also posted.